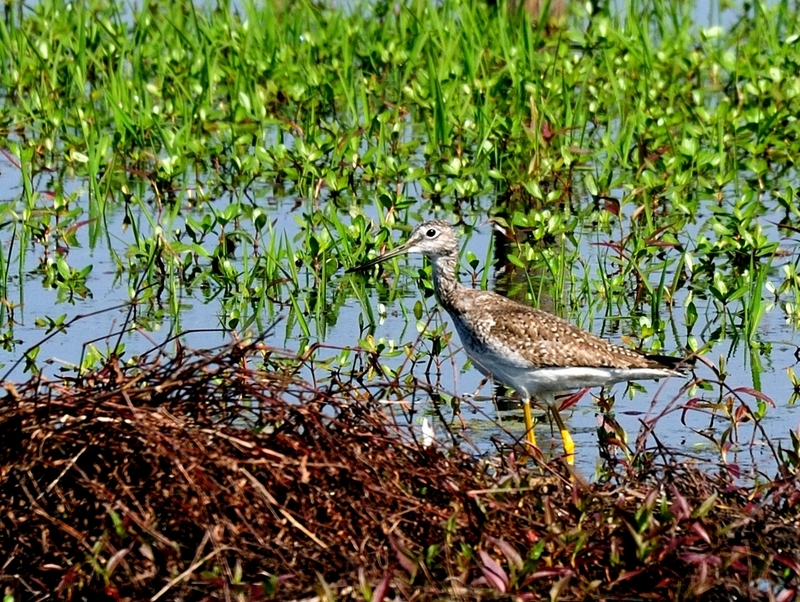 Prairie Creek Preserve is a relatively new preserve and does not have facilities of any kind. 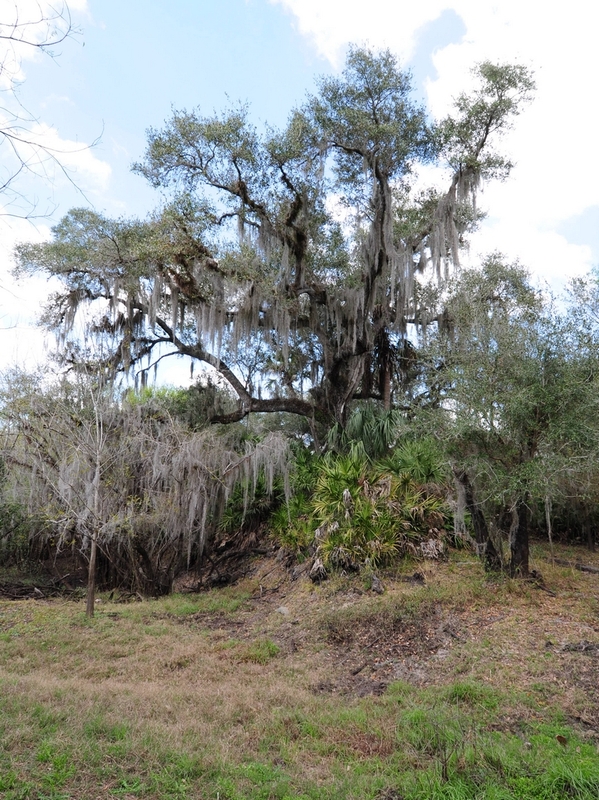 It has been left in as natural a state as possible since Charlotte County procured the land. 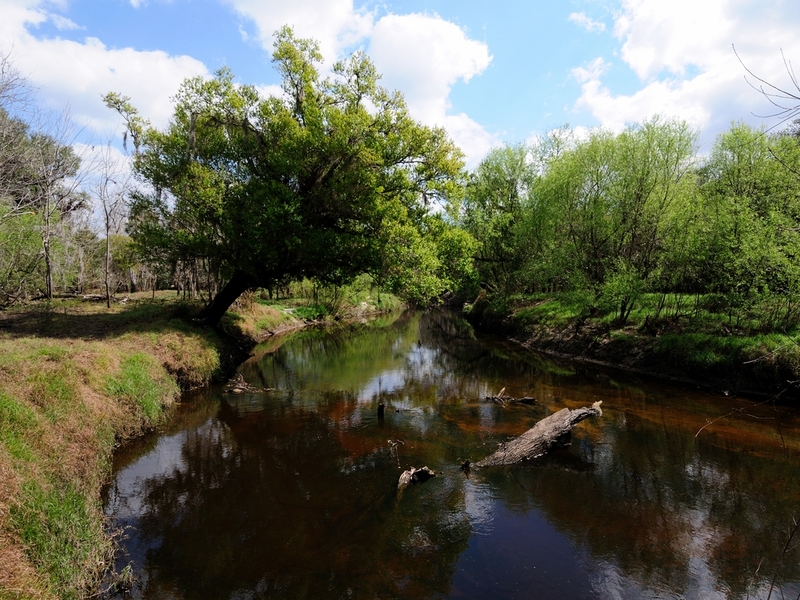 It consists of about 1600 acres with Prairie Creek running through the middle. 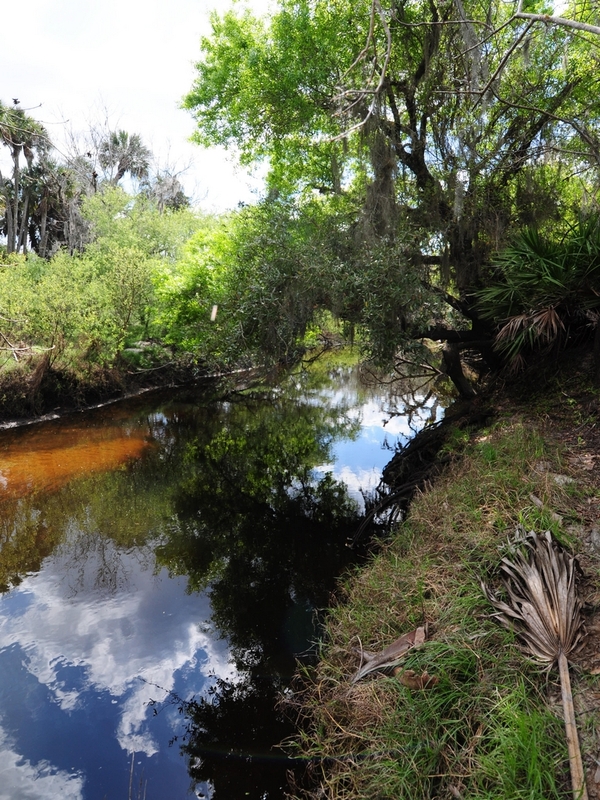 The preserve is located outside of Punta Gorda off Route 17. It is easily found by passing both ends of Washington Loop Road and immediately looking for the Brown signs for the facility. The first warns of the entrance being 1500 feet ahead and the second is at the entrance road. The entrance to the preserve is actually about 3.75 miles down this road but, don’t be in too much of a hurry. There is a small drainage canal on the left side that becomes wide occasionally. 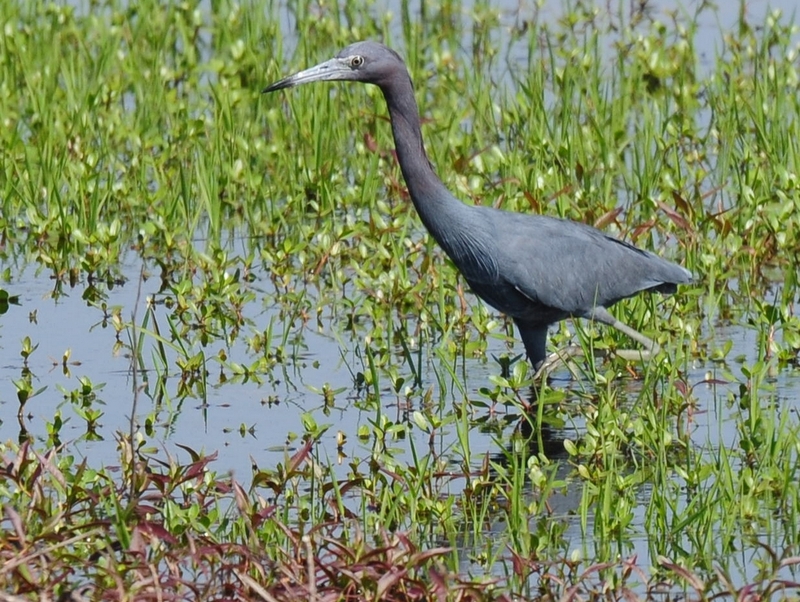 Today (2/16/11) I found this Little Blue Heron (Egretta caerulea) and Greater Yellowlegs (Tringa melanoleuca) wading around. Most of the road though is working farmland or grazing land. Eventually, you get to the main entrance to the Preserve. This is just a gate and cattle grid but there is a seasonal wetland there that is excellent for dragon and damselflies. Most of the land on the left side is dry prairie with a few pines scattered in it. 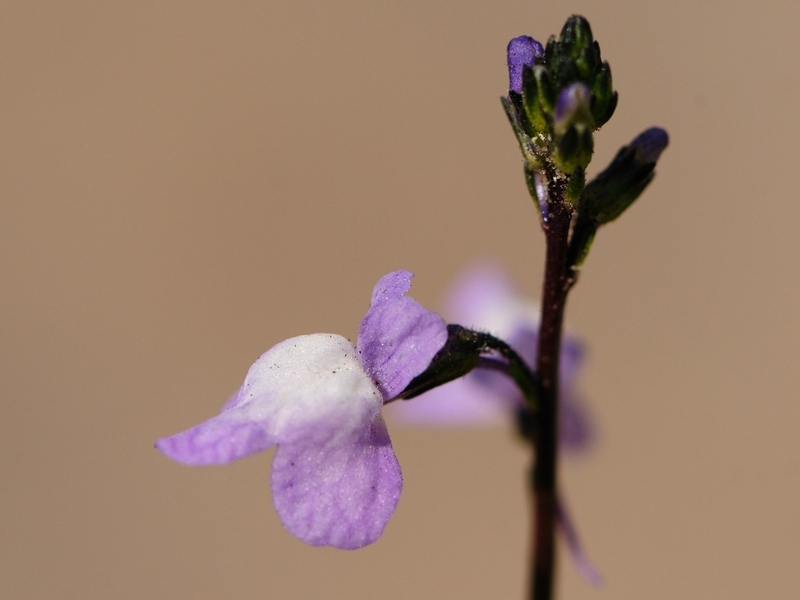 It’s been cool lately but this section is also great for wildflowers like this tiny little snapdragon. It’s bloom is less than 1/4 inch across. About 3/4 if a mile further and you find another gate where you will need to turn left and proceed about another 1/2 mile to the parking area. The road is wide enough to pull off, or at least well over, after you reach the first Preserve gate so don’t feel you need to miss anything and walk back from the parking. That area is really just a wide area at the end of the road where there are the remains of a cattle loading area. 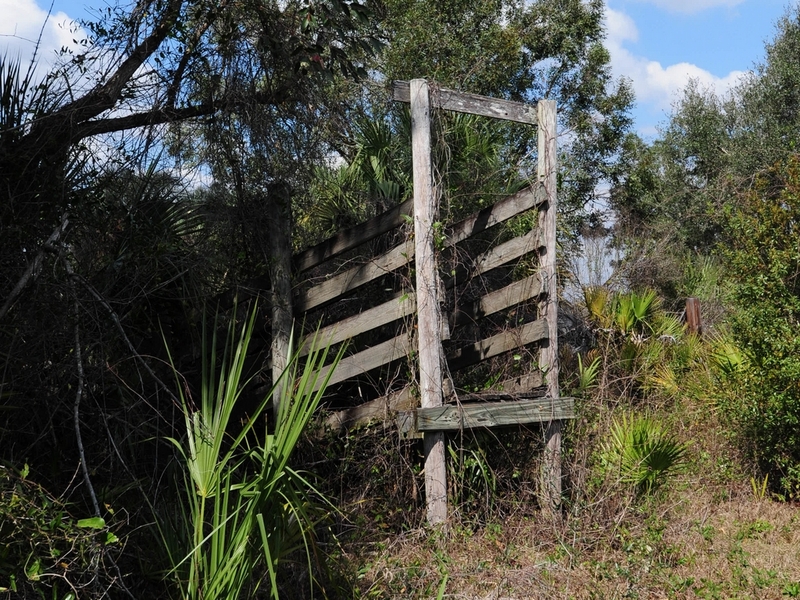 There are a couple of ranch enclosures there and this overgrown loading ramp. This is the end of the hardshell road and the beginning of Pedistrian and equestrian paths. It is a short walk to the creek through the pedestrian gate on the wide road leading toward the oak trees. 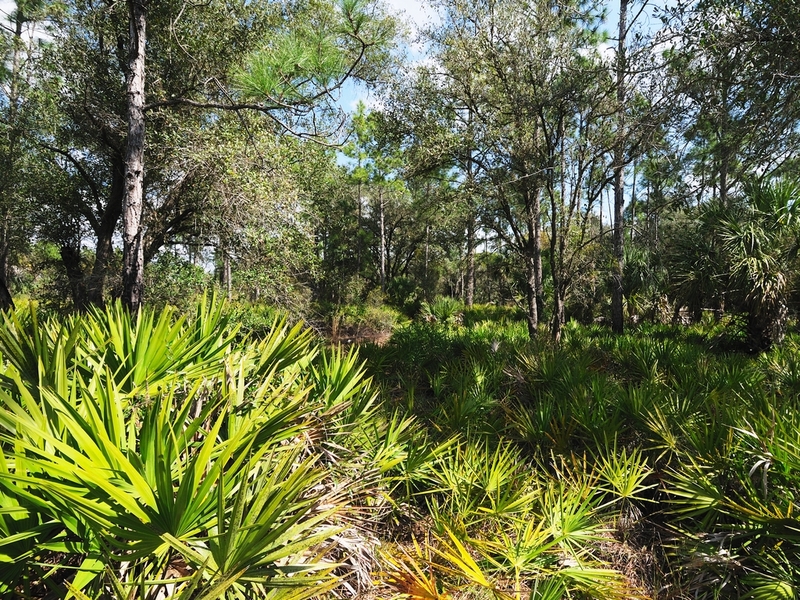 The first trees and habitat you will see is Saw Palmetto and pine. If you plan on walking through here better wear heavy trousers and boots and stay alert for snakes and pigs. This is very heavy undergrowth and I saw several new firebreaks which might indicate that a controlled burn will be coming soon. If you take the wide road though you will eventually come to an open area which is primarily Oak and light undergrowth. There are plenty of signs of feral pigs here. They aren’t usually a problem but Mama can get upset if you get too close to her piglets. 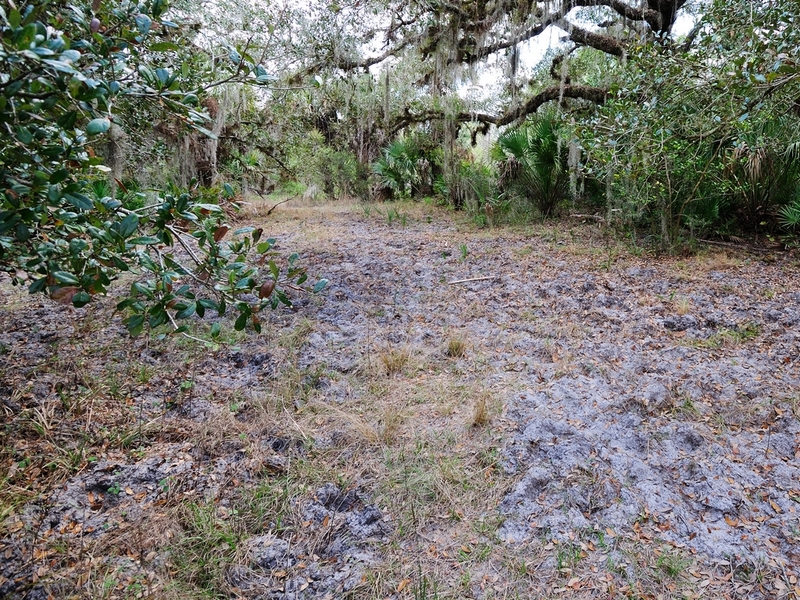 What you will see is torn up ground where the pigs had been digging up acorns from the oaks. 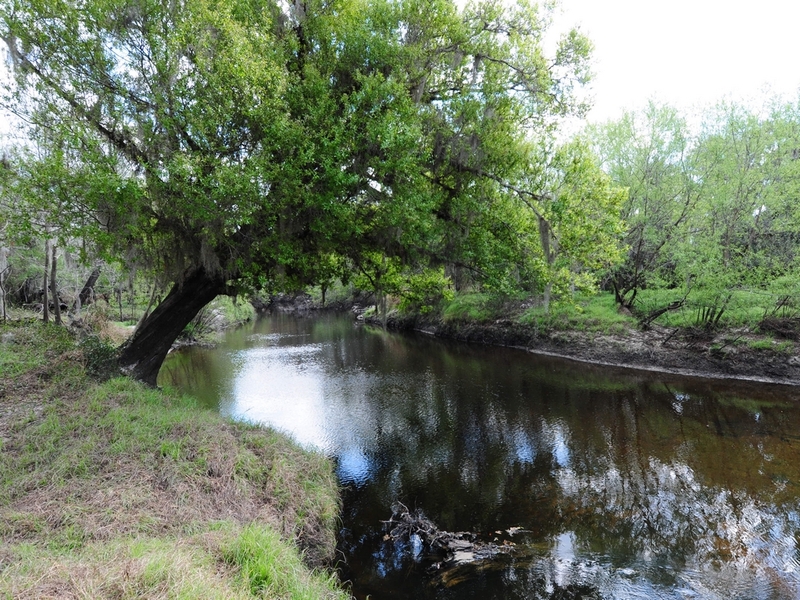 This open space is on the creek which hidden by the underbrush until you walk to the bank. The landmark here is an old Oak snag hanging over the water. It is obviously used as a swimming hole by some because there is a swinging rope hanging from a branch. 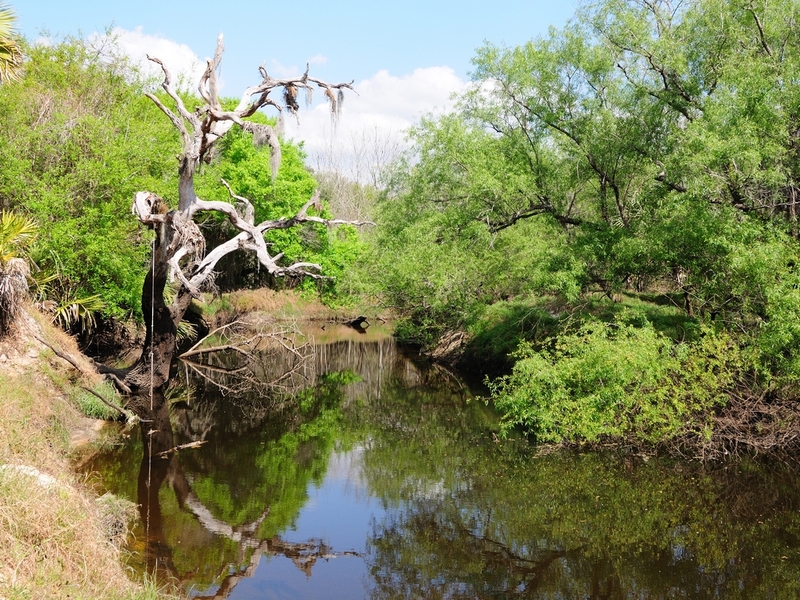 There is a path that follows along the river sometimes close and sometimes a little further away but all along the way you will be in the shade of very old Oaks festooned with Spanish Moss. Here are a few shots from the path. Just click on them for larger versions. This entry was posted in Park and tagged Photography. Bookmark the permalink.